Annie Chapman’s backyard garden, originally uploaded by espeedy123. The fourth in my series of stories on Dallas area vegetable gardens runs in today’s issue of The Dallas Morning News. It’s about Annie Chapman, a Thai immigrant who learned how to garden from her parents. She has made her entire large backyard into a big vegetable and flower garden. Of all the people I visited, she devotes the most space to growing vegetables. She is so nice, and whenever I talk with her she wants me to come back out to her place to talk gardening! I love the style of this place. 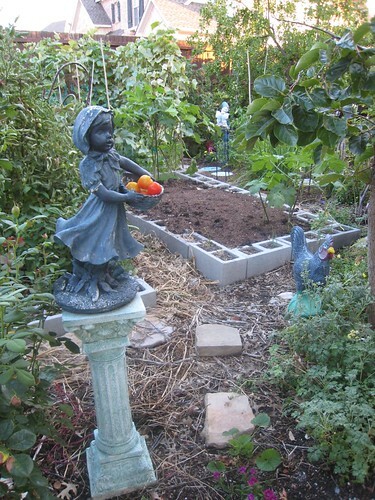 She’s got crazy statues like this one with the tomatoes, raised beds from concrete blocks, compost in an old smoker. It’s an excellent display of resourcefulness! Add organic matter all the time. In the fall when neighbors bag their leaves and set them out for trash pickup, confiscate them and spread over your beds so they can decompose over the winter. Plant unusual items. She has lemongrass, jujubes, persimmons, long beans, Thai lettuce, in addition to all the standard stuff. If anything underperforms she has a backup. I am working on fall seedlings right now. Does anyone around here have theirs in the ground yet? Metal Baker’s Rack, originally uploaded by espeedy123. Since we adopted Ruby, Michael and I have traded off walking her each morning. Over time, that’s a lot of ground we cover, and as other dog walkers will surely attest, there are interesting things out there. For one, people throw away amazing stuff. I thought craigslist was great, how about just the front curb? 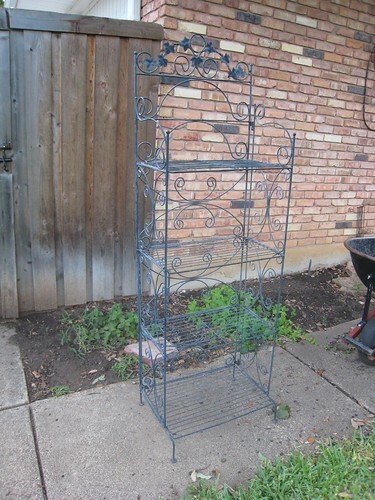 Yesterday Ruby and I came upon this metal baker’s rack sitting in the “brush & bulky” trash pickup spot. Mine now. Very exciting, I think I may use it in the backyard to store some pots. Our other recent coup was an enormous plastic flower pot in excellent condition. Terra cotta colored. Haven’t decided what to plant in it yet. It was sitting next to a dumpster in the neighborhood. 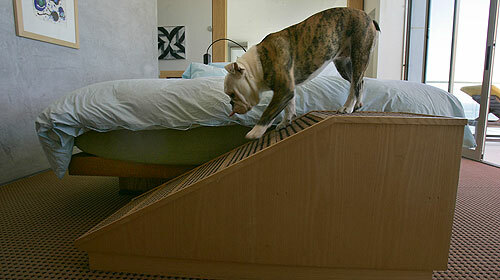 From the L.A. Times comes this great story about how to build a stylish and useful dog ramp. I like the addition of the ramp treads for traction. Ruby doesn’t sleep in our bed, but she has a tough time getting herself out of the lake we visit. This weekend, though, my brother-in-law built a step near the dock so she and her doggie cousins could get out. Ruby says thanks Sean! Carl’s Irrigation Detail, originally uploaded by espeedy123. 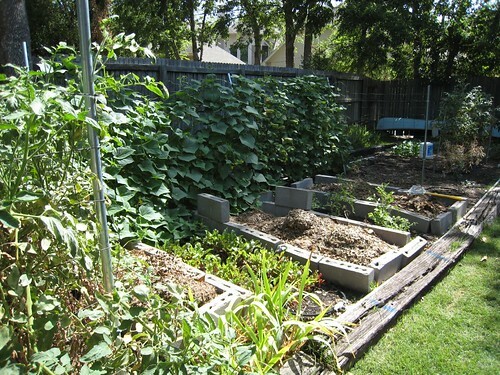 The third story in my vegetable garden series ran in Friday’s issue of The Dallas Morning News. It’s about Carl Rupprecht. 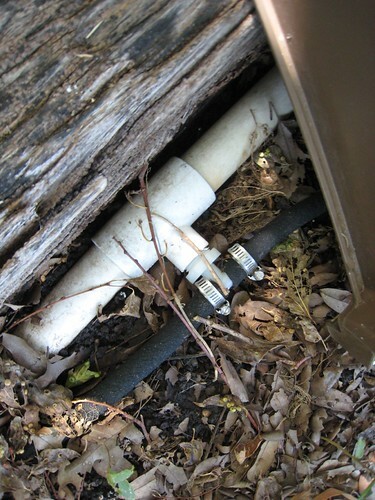 He’s got a lot of neat stuff in his garden, including an above ground irrigation system he built with PVC and half-inch soaker hose. * Orange oil deters pests. He used to use Sevin Dust (toxic! ), and he swears by orange oil now. * Pay attention to watering. Easier said than done, but his irrigation setup makes it easer. Visit the story online to see a graphic illustration of what he’s done. I have some broccoli sprouts started and am doing my best with that one. 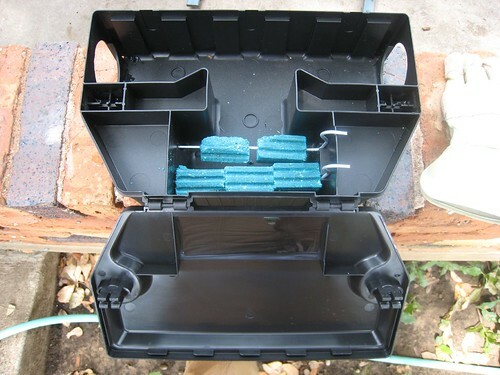 Bait Box with Knawed Rat Poison, originally uploaded by espeedy123. On Thursday afternoon Mark from Nature King Pest Control came by to help me out. He didn’t seem as appalled as I am about the rats. He checked out the attic and didn’t think there were any up there, and he said the fastest way to get rid of a lot of rats quickly is poison. We discussed my concerns about Ruby the puppy, and I told him that I try to be green and humane. He uses some green techniques like fox urine for repelling squirrels and possums. He went on to tell me about the nasty nature of rats, which made me feel better about the poison. 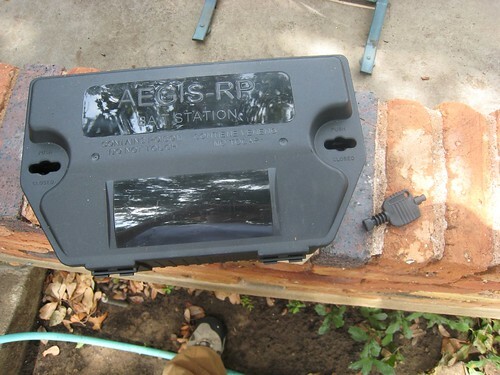 The bait box is also quite clever, and I feel confident Ruby can’t get to the bad stuff. It must be working because in just over a day you can tell that a nasty critter has eaten some of the poison and left, hopefully to die elsewhere. I own the box now (it was included in the $90 site visit), and I like that I can put it away or bring it out as I see fit. It’s a shame that these are not more widely available. I don’t think they have them at Home Depot, probably because the pest control lobby has a corner on the market or something. A few hours and three hundred dollars later, the porch overhang is gone. An improvement that was long overdue. It’s so much more open and light both in the backyard and inside the house. This project is like one of those low-touch, high-value whiz-bang changes they do on HGTV. Unfortunately rats started raining from the sky during the process. I only saw one scramble out, but my helper Ricardo assured me that about six others exited during deconstruction. There was a nest up in that little space, and what’s even grosser, a small hole into the attic in that corner circled in red. No possum ever emerged. 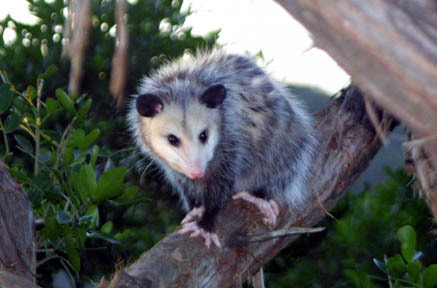 Perhaps I imagined what I saw to be larger, or perhaps the possum was up there to eat the rats. I may never know. 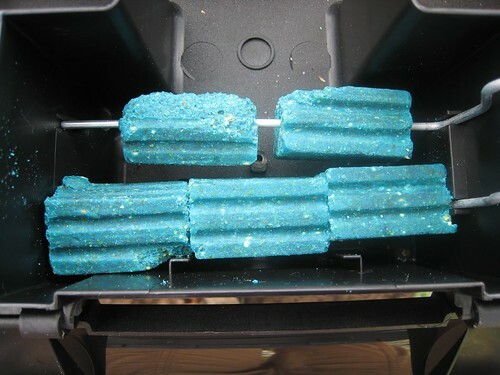 I went against my green instincts and purchased some D-Con poison cubes at Home Depot and shoved them up in that hole. Since then I’ve seen a rat at two different times either around or on top of the back fence. I have reached the limit of what I can tolerate rat-wise, and so I have a pest control guy coming out this afternoon to assess the situation. Meanwhile, I am investigating how to repair the two 10-foot sections of gutter that are now missing. 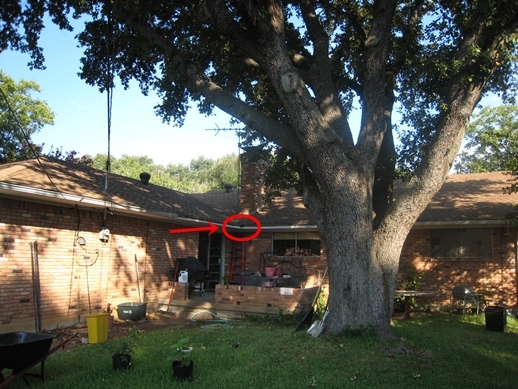 Before, that gutter ran around the edge of the porch roof. 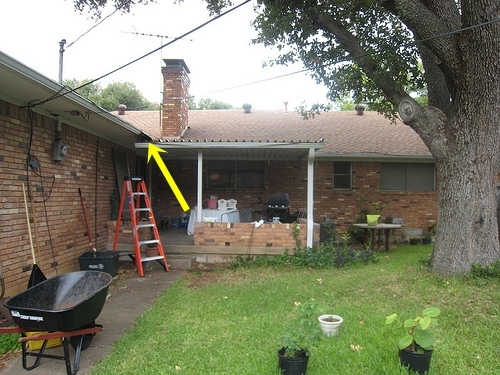 I called what appears to be the most reputable and favored gutter repair place on Angieslist. Not surprisingly, the quote seems high: $437. Does that seem high to anyone else? It took the guy nearly an hour of measuring and calculating to come up with the quote, which seems ridiculous to me. That right there was $100 of it. I bought a trap at Home Depot and put it up there next to that hole with some wet dog food bait in it. 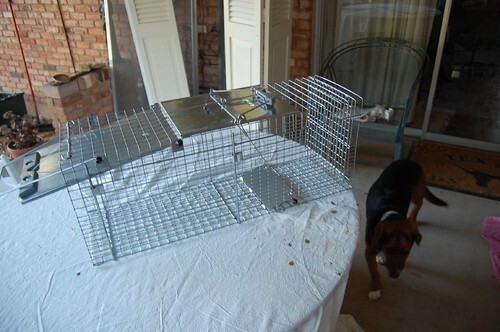 It’s super nifty how the contraption traps in a humane way, but it costs around $65, and after a couple days, no possum. I then heard rustling in my attic. Could have been a squirrel on the roof, but it seemed an awful lot like something in the attic. I began thinking of how I could get some additional attic traps without spending a fortune. 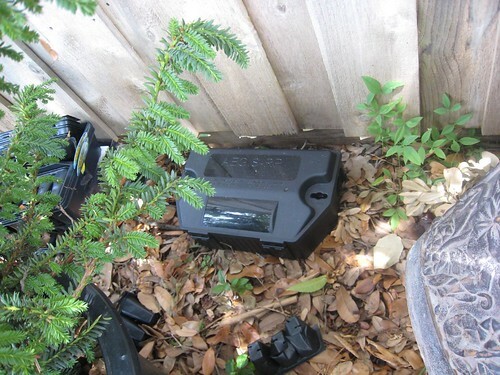 Would you believe that Dallas Animal Control does not loan traps when it gets hot? They told me it’s because people forget to check them and then the animal dies. Someone probably killed a cat that way once, and now we all have to suffer or pay sky high extermination rates. Upon thinking about this further I decided to go ahead with a project that’s overdue anyway — removing that old metal porch roof altogether. Eliminate it’s habitat (assuming he’s not in the roof). Michael and I are leery of ladders and so I am hiring a couple guys to come take care of this for me, and they are working on it right now. I will report back soon with results. I expect the roof removal to have a big aesthetic impact too, opening up the backyard and letting more light in the house.